3). Operational equipments: Turning machine, surface grinder, Sodick EDM machine for the part. 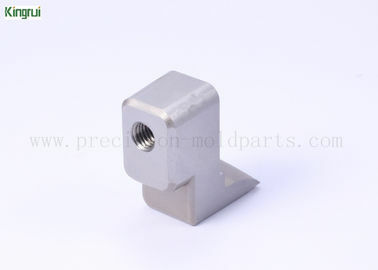 Connector mold parts: computer connector, phone connector, auto connector, and more. Injection mold parts: EDM spare parts, wire cutting parts, CNC machining parts, and so on. Packing Knives: food processing knife, paper cutting knife, packing knife and so on. Anti- rust Oil +PE film+ Plastic box + Carton, or clients' requirements. 5- 15 working days, depends on customers' order quantity and other requirements. Incoming material control to make sure all the raw materials are qualified. Operators follow the daily check list to check the machines to make sure they are in good conditions, and follow the spec to make products. Use qualified operators and correct parameters to make sure good quality. According to the quality assurance procedure to check the quality. Full quality check after production with testing machines. For the light weight or the small size ,we will use the International express such as TNT ,DHL,UPS,FEDEX etc.These express company provide good service and deliver fast,it always take three to five days to arrive according the area you are in,it saves your time especially for the customer who in urgently need of the products.For the heavy weight(more than 300KG) and large size(more than 0.01CBM),we will suggest you adopt the way of shipping via sea,if you haven't the shipping agent,please let us to help you find a reliable shipping company,we will ensure that your products will be arrive you on a safe and normal situation.